Home > Can I Buy an Apartment Building? Have you ever asked yourself, “Can I buy an apartment building?” Our answer is an emphatic yes! We have helped many of our clients finance their first multifamily property. As it turns out, investors with a variety of budgets seek apartment buildings. Some investors are looking for fix-and-flip properties for capital gains, while others are seeking long-term rental income. In this article, we’ll discuss the current trends in the apartment building market and how you can find/finance apartment buildings for sale. 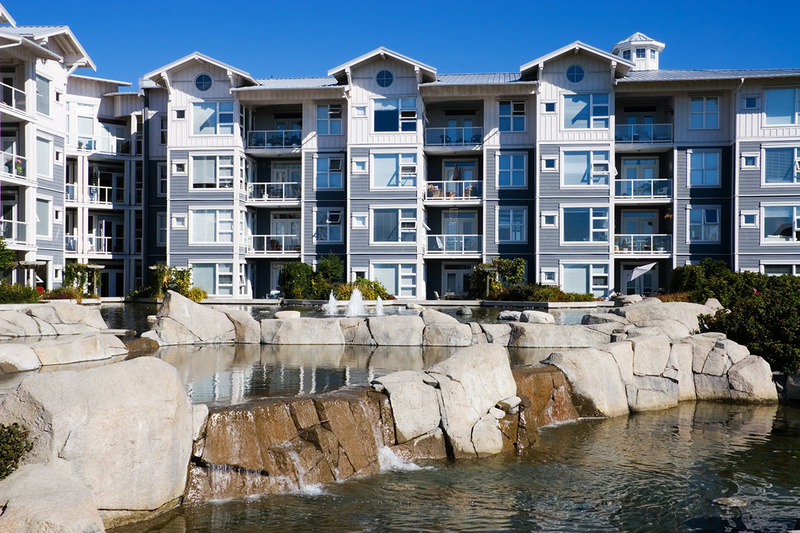 Today’s market dynamics create an opening for standard apartment buildings that are well-built, clean and affordable. You can buy an apartment building in this group for less money. The period from 2017 to now featured concentrated construction of luxury apartment buildings. While this might create an overhang of luxury units, it also creates an opportunity in the non-luxury market known as workforce housing. That is, many potential tenants cannot afford the luxury apartment rents but would nonetheless like to live in an apartment building. These are low-income to median-income workers that currently consist of about 13.5 million American households who are renters by necessity. According to CBRE, multifamily properties have had above-average rent growth and lower vacancy rates for the last four years. Over the last 10 years, new luxury apartments replaced many older apartment communities. The multifamily industry annually retires more than 100,000 units. The upshot is that you have a great opportunity to preserve/redevelop older buildings. This would include repurposing buildings, and building new affordable apartment buildings. Geographically, most of the new luxury apartment buildings are Class-A properties located in central business districts and downtowns. But this creates a relative shortage of Class-B and Class-C apartment buildings located in smaller cities, suburbs and rural areas. For the first-time apartment investor, these smaller apartment buildings are an excellent first project. That’s because you can buy an apartment building for an affordable price. These affordable multifamily properties draw workforce tenants that were essentially shut out of the luxury market. Currently, all U.S. areas benefit from strong conditions in the workforce housing market. Above all, Las Vegas and Orlando lead the country with 2018 rental growth of 7%. However, it would be a mistake to assume that workforce renters can absorb more rental increases. It requires higher wages to enable higher rents. The “rent-burdened” portion of workforce renter households was about 35% in 2018, compared to the 2006 figure of 21 percent. You must be aware of localities that instituted, or contemplating, rent control regulations that put a ceiling on rent increases. Labor shortages in 2018 helped explain some 30,000 apartment units with delayed delivery. However, this shouldn’t stop the delivery of about 319,000 proposed units in 2019. The important takeaway is that the delivery pattern is geographically uneven. Some areas will experience supply surges, while others will see decreases in apartment stock. California will have 5 out of the 10 largest supply increases in 2019. The three Bay Area metro areas are on the list, which is a good thing since these areas suffer from chronic undersupply. However, new supply appears in just a few submarkets in the Bay Area. Naturally, this might create opportunities in less well-served submarkets. Seattle will see about 13,100 new units in 2019, about double the long-term norm. Miami will also receive an above-average delivery of new units. At the same time, nearby West Palm Beach will see a sizeable decrease in new units. The bottom line is that the demand/supply situation for apartment units is highly dependent on geography. When we speak of affordable apartment buildings, we at Assets America® mean ones selling for $5 million to $25 million. Luxury apartment buildings can cost far more, in part due to the high cost of land in major municipalities. With so many new luxury units under construction (around 300,000 a year), opportunities exist to purchase older multifamily buildings. These older properties may require some renovation in order to compete. Having lower rents, these older apartment buildings often experience full occupancy. Additionally, they may have a steady net operating income (NOI) and a higher return on investment (ROI). Furthermore, value-add apartment buildings provide a good opportunity to make money. These are apartment buildings that suffer from various problems, including physical, managerial, operational and/or financial ones. Opportunistically, you might buy an apartment building with value-add characteristics at a bargain price. By addressing the outstanding issues, you stand a good chance of generating a high return on your investment. How Can I Buy an Apartment Building? As you recall, we said the answer to “Can I buy an apartment building?” was yes! But, how should you go about it? In this section, we’ll explain. For first-time apartment building investors, finding the right kind of buildings to buy can take some time, but it’s well worth the effort. To start, you have to determine where to look. To that end, you can use listing services and/or a commercial real estate broker to narrow your search. Assets America® is also a licensed real estate brokerage firm and can help you find the right commercial property! Many commercial real estate transactions occur off-market. That means these properties don’t appear on listing services – they are unlisted properties. The pool of off-market apartment buildings can be much larger than the one for listed buildings. Off-market apartment buildings are harder to find, but that means you’ll have less competition once you find a good candidate. The population of candidate properties can be much larger. Because there is no listed price, you can haggle directly with the owner rather than working through a real estate broker. It is possible to avoid broker fees, though usually the Seller pays for these. Most likely, you will have much less competition. You can organize your search for off-market properties by choosing one or more neighborhoods that interest you. You can then drive those communities for candidate buildings. To that end, you can search out the demographics of each community for important statistics. These stats would include items such as median income, unemployment rate, and median rents. Remember, you can repurpose other types of buildings, such as armories and warehouses, that you can convert to apartment buildings. If you don’t have the time or inclination to search out off-market apartment buildings, you can purchase an apartment building listed on one of the popular listing services. These services include CoStar, LoopNet, Showcase, TenX, Apartmentbuildings.com, CREXi, Point2Homes, Trulia, CityFeet and Realtor.com. Some of these services require you to use the search term “multifamily” vs “apartment building.” And as we have discussed in many of our other articles on our site, commercial multifamily means 5+ units. Remember, 1-4 units is not considered multifamily (commercial property). Rather it is known as 1-4 unit residential. It’s a completely different category, a lower-end category, that we don’t do. Additionally, you can work with a real estate brokerage firm such as Assets America®. Of course, you’ll may pay a broker fee, though usually the seller pays the fee. However, using a listing service or a broker, might well be worth your while. This is the most direct method, and while you might end up paying more, you are also more likely to close the deal. A lot depends on your budget, experience and time constraints. If you lack experience buying an apartment building, a good buyer’s broker can help you avoid mistakes. And such a broker can keep you from overpaying as well. Assets America® is happy to work with you to complete the the financing for your apartment building purchase. Assets America® will be happy to finance your acquisition of an apartment building with a loan for starting at a minimum loan amount of $5 million. We can arrange short-term, interest-only financing for purchases, reconstruction and rehabs. In addition, you can rely on us for intermediate mini-perm loans and long-term takeout loans, aka permanent financing. We are very experienced in multifamily and apartment deals, and you can benefit from our 30+ years of expertise. Contact us today for a no-obligation discussion of your financing needs. What is Multifamily Financing and How Does it Work?